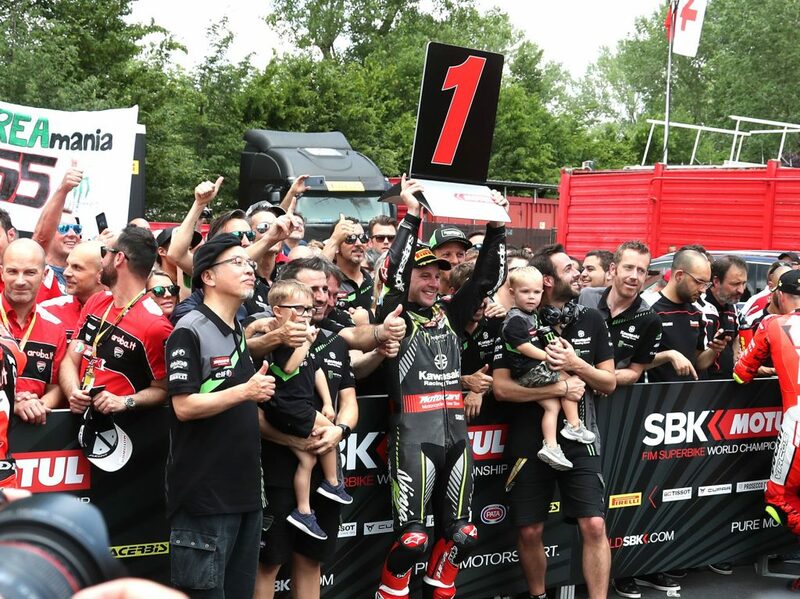 Imola, May 12, 2018 – The first act of the 5th round of the SBK World Championships unfolded in front of numerous fans that packed the grandstands and paddocks of the Autodromo Internazionale Enzo e Dino Ferrari. Among the day’s special guests were Jerry Scotti, who awarded the racers on the podium, Pietro Aradori, basketball player for the Virtus Bologna, and Dragan Travica, a player in A1 for Pallavolo Padova. Tomorrow, the sponsor of SBK 2018, Aida Yespica, will be in attendance. After taking the pole position, Jonathan Rea (Kawasaki) managed to hold on it in Race 1 despite his adversaries’ best efforts. Dominating the race from beginning to end, he exhibited a superiority that he had not shown yet in this series. A victory that was made even more important because it was attained on Ducati’s home turf, a track that they had dominated in the last four races with Chaz Davies. The Welshman from Ducati had the great upset of the day, finishing in fourth place due in part to an error in the first rounds that landed him in seventh place, which made for a difficult recovery. Even without the error, it would have been a tough battle against Rea, but Tom Sykes (Kawasaki) and Marco Melandri (Ducati) were right there with him. His only consolation is that tomorrow, thanks to the inversion of the starting grid, he will be able to jump up the pole while Rea will be stuck in the third row. Sykes and Melandri made it on the podium. The Brit managed to keep the racer from Ravenna at a safe distance, who had to worry about the return of his teammate at the end keeping his third place standing in jeopardy. The other Italian riders were also busy: Michael Ruben Rinaldi placed seventh after reaching third due to his great start, and Lorenzo Savadori (Aprilia) was able to secure eighth place thanks to a race full of grit and determination. In the Supersport World Championship, some rain during the Superpole 2 shook things up a bit, but in the end the favorites emerged victorious. At the center of the pole position was the reigning World Champion, Luca Mahias (Yamaha) who beat Jules Cluzel (Yamaha) by almost 1”. Finishing off the top three was the Turkish rider, Kenan Sofuoglu (Kawasaki) who showed great results in the last race of his career. In fourth was Federico Caricasulo (Yamaha), who is expected to be one of the great protagonists of tomorrow’s race. More great performances by Massimo Roccoli (Yamaha), who starts off the third row, and by Raffaele De Rosa (MV). Ana Carrasco’s star is shining bright in the Supersport 300 World Championship. The Spaniard from Kawasaki made her mark in the Superpole 2 taking her first pole position. The top Italian was Bastianelli (Kawasaki) with an amazing performance. Sabatucci (Yamaha) also did well with the fourth best time. At the end of the European Superstock 1000 qualifications, seven Italians made it to the top ten, but the pole position was taken home by the Chilean Scheib. He was followed by Delbianco (BMW) and Salvadori (BMW).